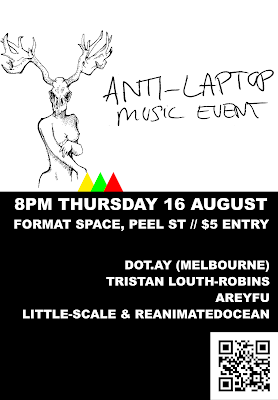 The first Anti Laptop Music Event is here, with four diverse acts from Adelaide and Melbourne. Sets include anything that has electricity running through it but isn't a laptop. Be there at eight. Listen to some cool music. Hang out with your pals at Format on Peel st.
Bring some cake if you know how to bake. Destroy everything.